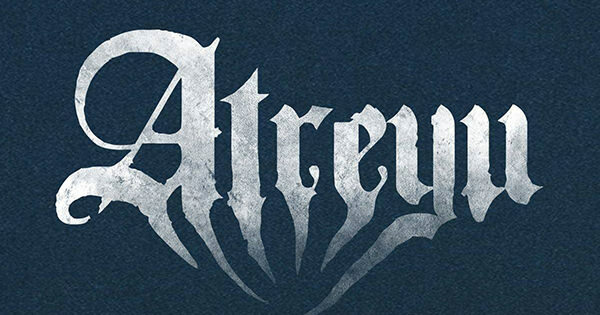 In Our Wake, the new album from Atreyu, has debuted at No. 72 on the Billboard 200 chart, selling roughly 8,300 copies in its first week of release in the United States. The record also landed at No. 15 on the Top Album Sales chart, No. 2 on the Hard Rock Albums chart, and No. 9 on the Rock Albums chart. 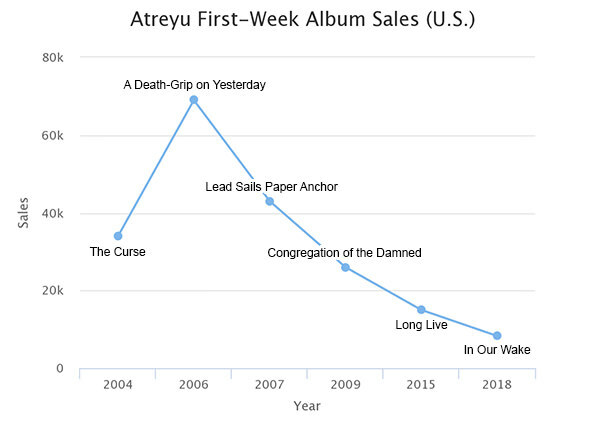 Atreyu's previous album, Long Live (2015), sold 15,000 copies in its first week, bowing at No. 26 on the Billboard 200. Going back further, 2009's Congregation of the Damned debuted at No. 18 on the Billboard 200 with first-week sales of 26,000 in its first week. Its predecessor, Lead Sails Paper Anchor (2007), landed at No. 8 on the Billboard 200, selling 43,000 copies in its debut week. Atreyu first cracked the Billboard 200 in 2004 with the release of The Curse. absolute LOL @ the graph. Atreyu is for fcking rubes. love this site having artists on it. thank you for the graph, which makes it easy for us fans to connect to the seriousness of the sales. ^ Yeah this site is one of the best things on the internet. I can't think of any other sites that have this type of community, and that are as organized and well-run as this one. Glad I created it. Enjoy. Would love to also see a graph of LG traffic decline since Emmire and TAS stopped beefing. "Suicide note the only release worth anything and I'm sure it aged terribly"
i see you guys forgot to add Zao's billboard 200 chart so I'll leave it here! Students, that is what we call a Please Just Give It Up chart. "We've always been a diverse band that tried new things but this is different. This is a whole new level." i'd wager now isn't the time in your career to take risks lol. now would be the time for a "back to the heavier roots" record for your core fans. Nobody new is gonna suddenly start liking Atreyu at this point. ^what I said when this was announced. Congrats on bottoming out dudes. This graph is actually a perfect representation of what happens when metalcore bands get too big for their own good. Album following their signature release creates so much hype and sells well, turns out they tried too hard and fcked up, and then the world just gradually forgets about them. This is fake news...want to hear REAL NEWS? PLAYING IN IT"S ENTIRETY..."FOREVER". A true defining album of the budding silver age of metalcore. Has anyone tried the green halloween hamburger from BK?